III – Download and install Linnworks on your machine. Linnworks is an order management and stock control system that integrates with multiple sale channels like eBay, Amazon, Magento and now, Jigoshop. Linnworks handles the whole sale channel process from order fulfillment to shipping, stock control and inventory management. Using the Jigoshop Linnworks Integration extension you will take advantage of a powerful sale management system, which will control your store inventory, update orders, send emails, print invoices connect with shipping vendors and many more. Automatic synchronization of all orders from Jigoshop. Just pick the order status you want to sync and all orders will be downloaded into the Linnworks system. From there you will be able to print invoices, shipping labels, packaging and much more. Inventory management allows you to have your whole inventory in one single system. This way you will never oversell your products. Once you sync Jigoshop and Linnworks, any sale downloaded by Linnworks will be automatically reflected in your Jigoshop store and the other way around. You have many shipping options and need to track each order shipping method? 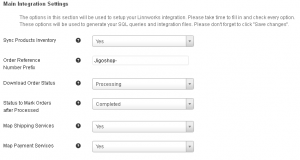 Jigoshop Linnworks Integration allows you to map all your shipping options with Linnworks shipping services. You will automatically know what shipping option the customer chose and take the appropriate action. After the order is processed and shipped it will be updated in the Jigoshop store, at which point a tracking number (if such is assigned) will be emailed to your customer. Shipping Services and Tracking number can be conveniently displayed on the View Order and Track Your Order pages. Jigoshop Linnworks Integration adds “back in stock” notification, which is automatically sent when new stock is added to an already “out of stock” product. It adds a new “Order Completed” notification, which informs the customer the order is shipped and provides the Shipping and Tracking info. 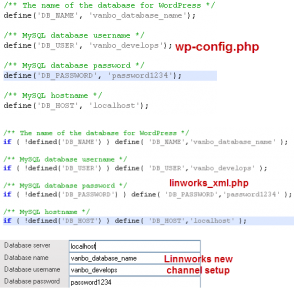 Before you setup the Linnworks integration there are prerequisites that you should know and meet. You need a Jigoshop store set up and at least one order placed. The order needs to be in the status that Linnworks will download. Every Product needs a unique SKU. That is true for all products and variations. Linnworks treats variations as a separate products. Main variable product does not count in inventory. You should track inventory for each variation in the Variable products. Essentially the main variable product will not count toward the inventory and could stay unlinked in the Linnworks system. Please bear with me. The installation is not three steps and we’re done. It is not complicated, but involves a lot of steps. Upload the `jigoshop-linnworks-integration` folder to the `/wp-content/plugins/` directory. Enter a prefix you want to appear in your Order Reference Numbers. This option is important to distinguish selling channels. Pick the order status of the orders Linnworks will download from your store. Recommended: “Processing” is the most appropriate status. Pick the status your orders will be update to, when marked as processed in Linnworks. Recommended: “Completed” is the most appropriate status. Choose if you want to sync shipping and payment services. Choose if you want to send “order complete” notifications and if you want to leave a note to the customers on the orders. Enable debug mode. Enable this option only to generate information from couple of syncs. IMPORTANT: The debug log can be substantial depending on your store orders. Do not leave it on for a long time. Download Linnworks from your account page and follow the “Installation Instructions” on their website . Once installed start Linnworks and follow the “Integration Instructions” here – For “Type of the website cart” choose “Bespoke Website”. 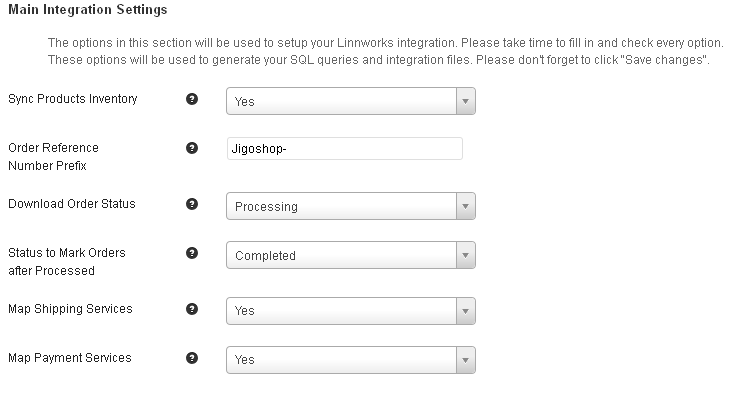 When you get to “Step 6” from the “Integration Instructions”, you will need to open your store Linnworks settings page (Jigoshop > Settings > Linnworks) and scroll down to the “Generated Queries”section. After you pasted all queries click on the “Test All” button and continue with the integration steps to the end. 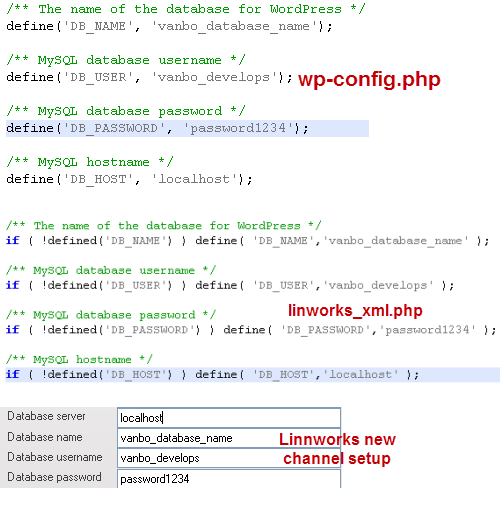 When the integration is done open the “linnworks_xml.php” file (in notepad++ or your favorite editor) that came with your Jigoshop Linnworks Integration extension. After you filled the fields with the appropriate information: . Your integration is now setup. Enjoy! Enable if you want to sync Linnworks and your store inventory. The inventory will be controlled from the Linnworks system. IMPORTANT: This option will only allow you to generate the query you will need to sync the inventory. Turning off the option after the inventory was synced will not automatically unsync it, you will need to delete the “UpdateInventory” query from Linnworks system. This is the prefix that will be applied to the Linnworks “Reference” field in the order details. It is used also for identifying and updating the orders. IMPORTANT: If you want to change this prefix, you will need to regenerate the SQL queries and re-apply them in Linnworks. Choose what status orders you want to download into the Linnworks system. RECOMMENDED: usually the order status to download would be “Processing”, since this will indicate that the order is paid and the inventory is lowered. Choose what status the orders to be updated to, after they are processed in Linnworks system. RECOMMENDED: usually this is the “Completed” status, which indicates that the order is packaged and mailed. Enable if you want to map the shipping methods to the shipping services in Linnworks. Enable if you want to map the payment methods to the payment services in Linnworks. Notification is send when the product stock is marked as 0. 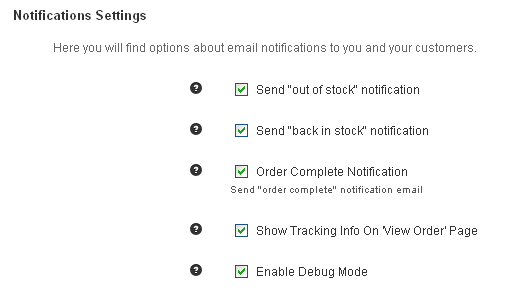 Notification goes to the “Inventory notifications” email set in the Jigoshop installation. Notification is send when new stock arrived and Linnworks updates the stock level from 0 to a positive value, but more than the “Low stock threshold” inventory set up in Jigoshop. 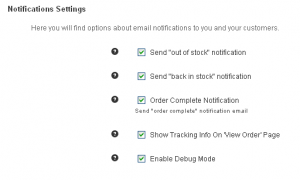 Notification goes to the “Inventory notifications” email set in the Jigoshop installation. Send a custom notification when order is marked as “Completed” from the Linnworks system. This Notification will be able to provide information on Shipping Service Name, Tracking Number and the time the order was processed on. The plugin generates error logs every time it encounters errors in the payment response. If you want those error logs to be e-mailed to you, enable this option. IMPORTANT: The debug log can be substantially big depending on your store orders. Do not leave this option ON for a long time. VERY IMPORTANT: Do NOT Permanently Delete any of your products. Trashing a product is good enough. Permanently deleting a product will leave you with a none working Linnworks integration and sometimes a big mess to sort out. If you still did do it, please use the contact form to get help.